Saturday 11th May: HEALTH AND WELL-BEING FAIR 10am until 4pm at the Steam Bar, Great Western Hotel. Newquay U3A will have a stall. Please contact: Gret 852895 if you would like to get involved. 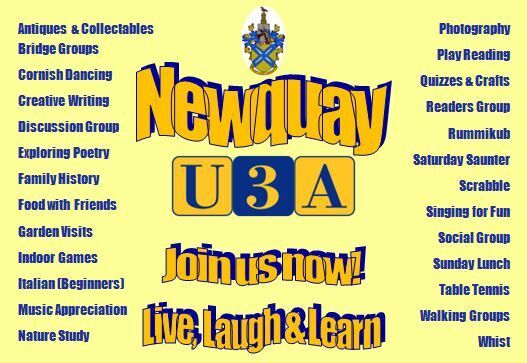 Live, laugh and learn with Newquay U3A. Just look what Newquay has to offer: stunning scenery for our walkers, who enjoy walking the beaches, or cliff top walks on the SW Coastal Path and inland walks along estuaries, bridleways, through fields and woodland. But there's plenty more to do in Newquay U3A besides walking. Just explore our website to see what other activities our social groups enjoy.